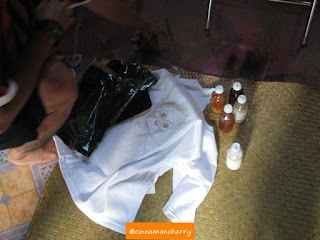 Petandang--Traveler: Paint Your Own T Shirt in Tanjung Keluang! Paint Your Own T Shirt in Tanjung Keluang! Nipa palm (Nypa fruticans wrumb) is a very useful plant. 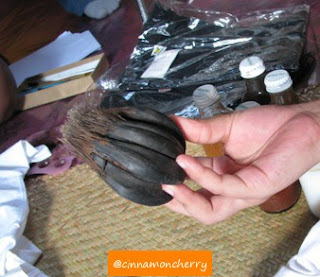 Its leaves can be made into a roof and woven into baskets, its sap can be harvested as an alcoholic beverage (nira/tuak nipah), its young fruits can be eaten as desserts. You might already know this. But how many of you are familiar with its usage as a paint? Not many, perhaps. In Tanjung Keluang, you can learn to paint T Shirts using nipa palm's sap. First, you make a rough sketch using the paints derived from the sap by pencil, then you dab the brush bit by bit to enhance the drawings. When you think it's complete, you coat the painting using a mixture for silk screen (screen printing), wait until it dries, then you're done! The paint will last for a long, long time, especially if you wash the shirts by hand and dry it in a shade. The sap will yield dark-brownish paint. You can adjust the color by adding more thinner or increasing the amount of sap. The sap is derived from the fruit, as you can see here.